Expanding losses and a growth slowdown has investors feeling pessimistic. Will new management turn the tide? 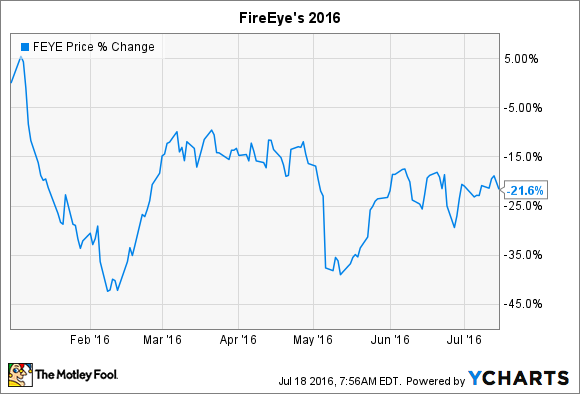 What: It has been a rough 2016 for cybersecurity specialist FireEye (NASDAQ:FEYE). Shares are down more than 20% so far this year, according to data provided by S&P Global Market Intelligence. FEYE data by YCharts. Data through market close on Jul. 15. That brutal run actually puts FireEye ahead of larger rival Palo Alto (NYSE:PANW), which has declined nearly 30%, year-to-date. So what: Investors are less optimistic about FireEye's prospects for achieving profitability as sales growth slows. First-quarter sales gains were solid, weighing in at 34% gains. However, that barely met the low end of management's guidance. What's worse, the company's gross profit rose at a slower pace than revenue, leading to an expanding loss: FireEye produced $156 million of red ink in Q1, compared to a $133 million loss in the year-ago period. In contrast, Palo Alto saw much faster growth, 48%, and its profit margin held steady at 73% of sales -- compared to FireEye's 62%. Now what: In May FireEye lowered its full-year sales outlook and announced that CEO Dave DeWalt was stepping down as part of a big management shakeup aimed at repositioning the company for faster growth. Investors should hear from new CEO Kevin Mandia, who officially took the reins in mid-June, when the company posts third-quarter earnings results on Aug. 4. Wall Street isn't holding out for much good news in that report. Consensus estimates call for sales growth to slow even further, to 23%, as FireEye loses $0.39 per share for just a slight improvement over the prior year's $0.41 per share loss. More important than those headline figures will be what Mandia has to say about his executive team's plan for sparking faster growth as they work toward achieving profitability.